First I made a two appearances on the mighty "Dennis Has A Podcast" show, then Marvo invited me to take part in the Nosh Show, and now, I have followed in the footsteps of the mighty Steve from foodjunk to make a guest appearance on Nerd Lunch. Alright, go listen to the show here. After I started the show with a horrendous Gary Busey joke, the show had no place to go but up... if you just ignore my use of my old microphone (sorry guys!!). It was a ton of fun as I talked about On Second Scoop and the awesomeness that is the Nosh Show before we dug into the main course and finished up with some nerd to-dos. Every episode has a different core topic, and our topic was condominiums condiments. There was also talk of smurfs. And Gojo. And Wesley Snipes. Don't worry, it'll all make sense when you listen. It's always a little nerve-racking for me to talk to new people, but they were gracious hosts and made it easy for me to jump in and do my best to keep up. Hopefully you'll enjoy the show. Please feel free to leave any comments, tip, suggestions, etc like "please throw away that stupid old mic already". But seriously, it's all about bringing the love of ice cream to a bigger audience. They even gave me a few ideas for breakfast sundaes. 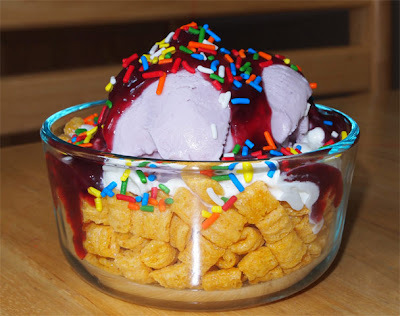 Oh yeah, I've been debating bringing some cereal to the breakfast sundae project, and though I did't have any Crunch Berries on hand, I do have Cap'n Crunch. Mmmmm, I added some whip cream, berry topping, and sprinkles for good measure. Oh I love ice cream... and cereal... and big breakfasts. Thanks again for the invite guys, it was a ton of fun. Keep scoopin! Try some Grape Nuts cereal on your ice cream. It will sound like you're eating gravel, but it's good! I do actually love grape nuts in my yogurt, and I've tried grape nut ice cream (very good), so yeah, I should make a breakfast sundae with grape nuts, shouldnt I? Captain Crunch on a sundae is a great idea! Perfect amount of sweetness and crunch. I can't believe I have never thought to put cereal on my ice cream. I have a sad lack of imagination. Thanks for sitting in our Fourth Chair. Loved having you on and as we said on our show, we're all huge fans of The Nosh Show and what you're doing here. I've tried Cinnamon Toast Crunch in my ice cream before - yum! I need to branch out more!